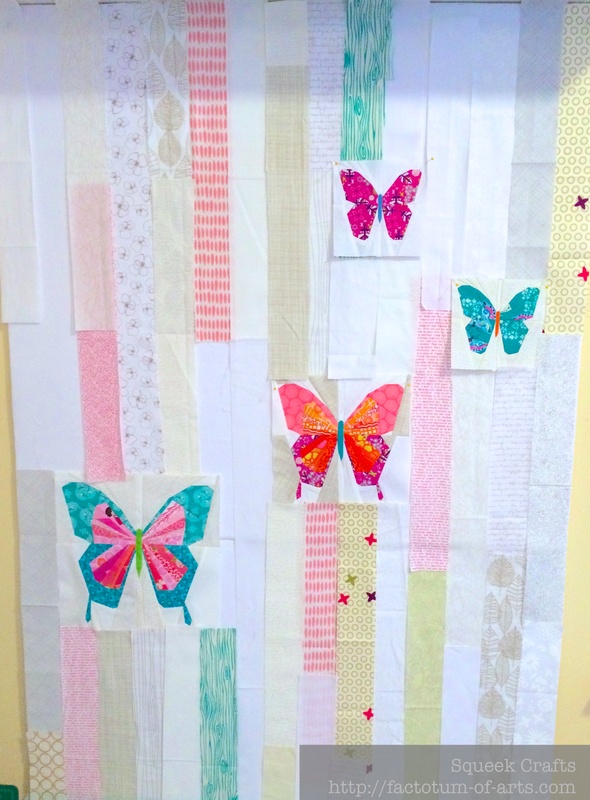 I have butterflies in my stomach….I am loving where the “Kaleidoscope of Butterflies” quilt has gone. Is it not totally satisfying when something in your head actually turns out how you image!! Well, the quilt top is complete. I think each of the butterflies deserve a close up. The scrappy low-volume background was, definitely, what was in my head but I started to have doubts in the process of laying it out. I love that I posted on IG and instantaneously got feedback…love this community…and I kept moving along. The other question I was going back and forward with was if the cream/pink background (left) was to subtle (wishy-washy). I played around with adding a low-volume teal in the mix (right)….as you can see that is what I stayed with. I think it adds a depth and balance to the top. Now onto basting, quilting and binding. 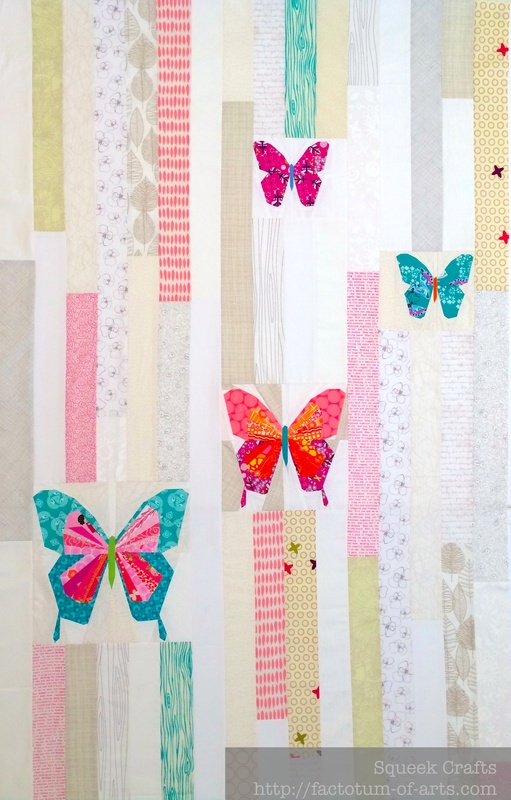 Don’t forget to go over and vote for the Bloggers quilt festival. There are some fantastic entries. Here were my two entries; A Fine Day and Hothouse Orchids. I will be catching up on replying to comments today, I promise!! 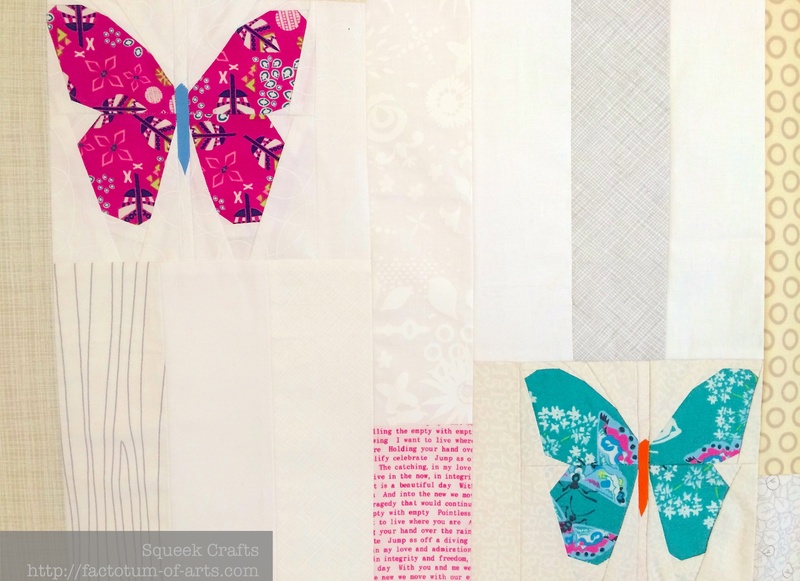 I am linking up with Amanda Jean @ Crazy Mom Quilts for Finish it up Friday. 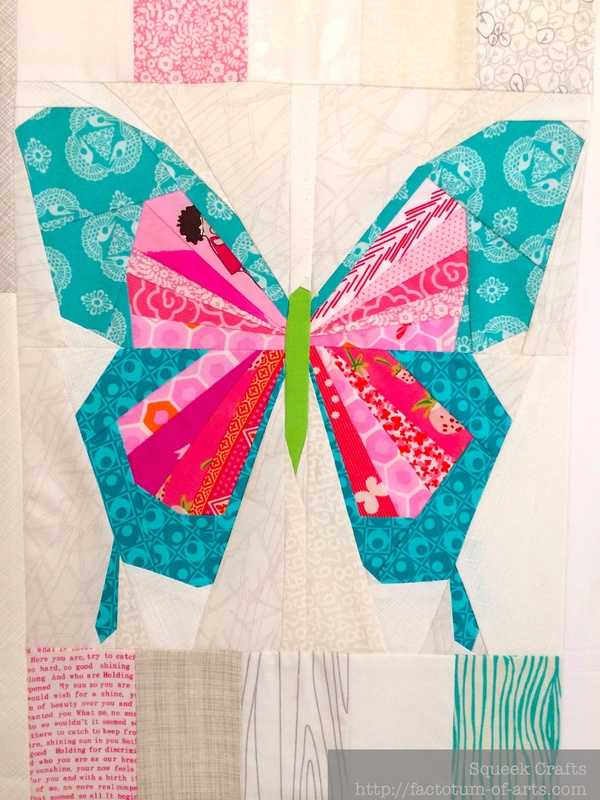 This entry was posted in Uncategorized and tagged butterflies, Kaleidoscope, Kaleidoscope of Butterflies, low volume, patchwork, quilt top, quilting, Tartan Kiwi, tartankiwi on May 24, 2014 by mlwilkie. I do like those light teal strips in there! Can’t wait to see how you decide to quilt it. Beautiful quilt top! The background looks fantastic! 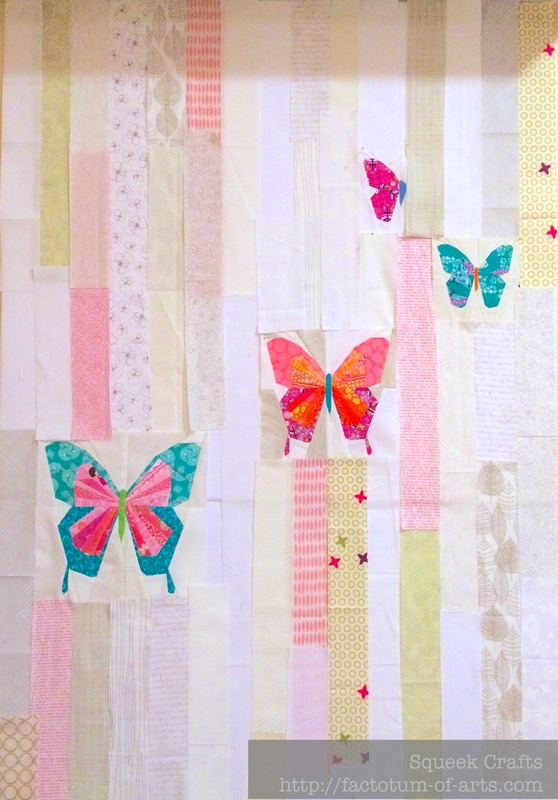 Pretty, pretty quilt. And I like the final version of the background so much better. This looks so wonderful – the addition of the teal in the background was a great choice! I just love this!!! Beautiful work! Even better than I imagined! You have hit this one out of the park! this is so beautiful. I love the brightness of the butterflies on the low volume background. Wow! the low-volume background was REALLY the way to go on this. I am filing your idea in my head. When it is finished, or even before, do you mind if I PIN it on Pinterest? I wouldn’t do it if you do not approve. I keep a lot of ideas there and I am so glad I do.I couldn’t possible remember all the creative things other people thing of!!! Love! And the teal was a great decision. 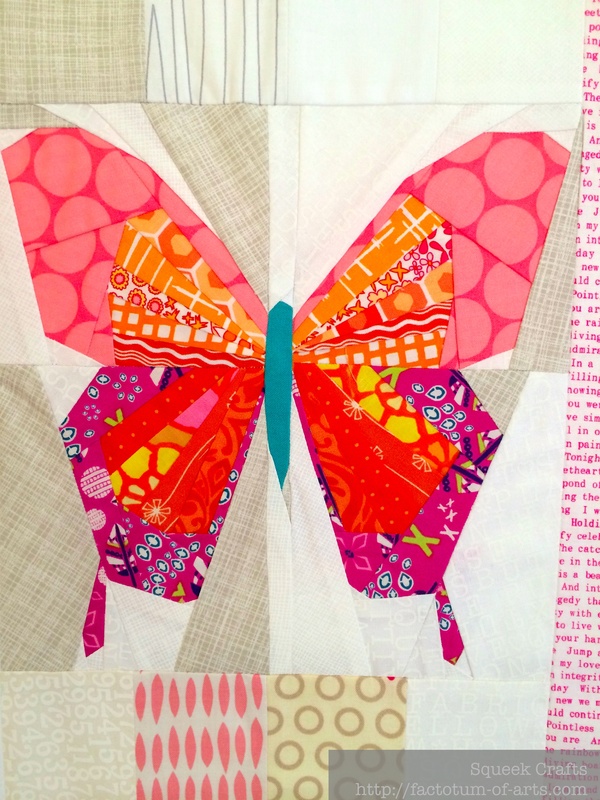 This is inspiring me to try paper piecing. This turned out really beautifully! The balance of colours is really great. On the Instagram thing… I can’t use it any more! I updated it and the last update killed it for me… I can’t even open the app any more! So disappointing as I love seeing what people are working on. And that was so awesome that you posted all those pictures for me the other day! I wound up buying just enough fabric in four colours to test it out – plum, pumpkin (total wildcard, that one), jade, and a paler grey from Cotton Couture. Hopefully I’ll be able to settle on a colour for the entire quilt that way, though they’re huge blocks (30″), so maybe I’ll make four of them and then think that’s enough and will just put together a lap quilt with the four colours rather than making something more unified. I love this soooo much. Your stash is gorgeous and well-curated. And the butterflies are breathtaking. Absolutely gorgeous. I love what you did with the background! I saw a snippet of this on Instagram and had to come and check out some better photos. This quilt is so ridiculously fabulous. I am in LOVE! I’m so impressed by what comes out of your mind. Your ideas are gold! This one is definitely one of the best though – I find it completely inspiring!!! Thats a really pretty quilt. Adding the teal was a good idea. I love the butterflies too. Pingback: Being Queen | Ants to Sugar – Fabric. Quilting. Some modern. Some traditional. I would love to see some dimensions or sizes or even a pattern! I’d buy off you if I could 🙂 love it!